Nicholas Petrucci is based in London, but knew about More than Diamonds through a friend. When starting his search for an engagement ring, Nick already knew that he would not be looking for a Diamond. Finally he found an Opal Ring he liked and was certain that his fiancée would too. We had an email chat with his fiancée, Lily Beckett, about his choice. I’m 28 years old, I work as a freelance make up artist. I’m never in one place long, travel about a lot and am constantly on the move. I’m expecting my first child in one month and excited about the change it will bring to my life. We all know the famous phrase “Diamonds are a girl’s best friend”, but it does not seem to apply to you. Please explain. I chose an Opal rather than a traditional Diamond because they are far superior in my opinion, because they have so many different colours to them, like a rainbow, and are slightly more magical looking. I like white gold because it is a precious metal but not as traditional as yellow gold. The classic ring design just makes the most of the Opal and shows it off nicely. Nicholas told us that he had proposed without a ring at one point, and then made an ‘official’ proposal when he found the ring a few months later. Please share with us your proposal story. I met Nick in New York, we knew each other about 5 years previously but the romance happened in New York. When we both returned to our homes – me to London and Nick to Atlanta – we were constantly in touch. I had a break between jobs so I decided to go out to meet Nick in San Francisco, where we spent 2 weeks together traveling California and stayed in the Redwoods forest for sometime. I then returned to London and Nick went to work in northern California. One month later Nick came to live with me in London. He proposed to me a month later at my mums house, nervously. He had no ring at this point but I accepted his offer. I had no doubt in my mind that this was the man I would marry. One month later I fell pregnant, a happy surprise. 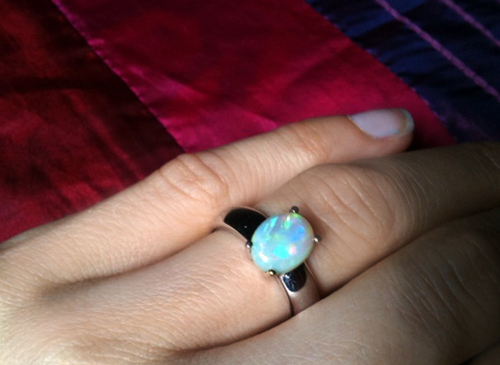 It wasn’t until 6 months later in Paris when he gave me my beautiful 18K White Gold and Opal ring. We were in a hotel room, it was the night before he was due to go to Sweden to work for 2 months, and we would be apart for all this time as I didn’t want to fly because of the pregnancy. I was sad, and then the next minute he put this beautiful ring on my finger. Do you have any tips for boyfriends who are looking for an engagement ring? I feel that an engagement ring should be well thought about and suited to the personality of the wearer. There are so many beautiful stones out there – why go for a Diamond? I wouldn’t change mine for anything. I’m constantly getting compliments on what a beautiful fiery Opal it is. Do you know where Nick got the stunning firey Opal ring or is that a secret?! 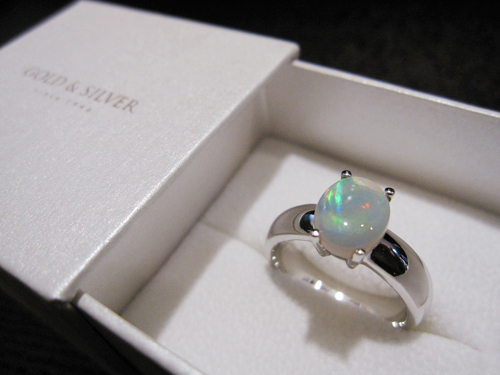 I am an October baby and have been searching for the perfect Opal ring for years and this one is just beautiful! Any info is greatly appreciated.